Did you know that 2,200 Americans die each day from cardiovascular diseases? That’s about one every 40 seconds. Shockingly, cardiovascular diseases claim more lives than all forms of cancer combined. February is American Heart Month, an excellent time to teach your family and friends that cardiovascular disease can often be prevented by making healthy choices and properly managing their existing health conditions. 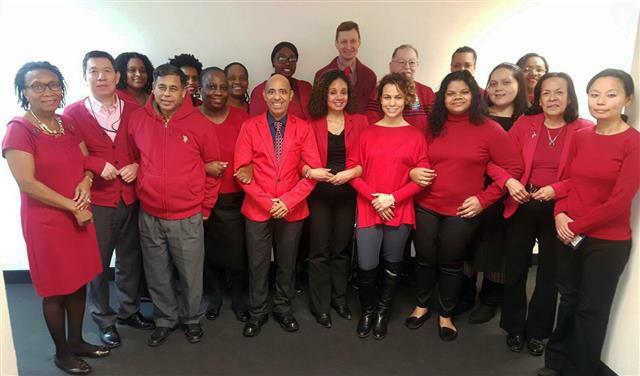 Bronx Community Health Network has been proudly participating in Heart Month to raise awareness about heart disease and increase knowledge about prevention. In addition to going red for Wear Red Day on February 3, BCHN's outreach team has led workshops on heart health, women's health, hypertension and nutrition. Go Healthy! WALK For Your Heart! Walking is one way to lower your risk of heart disease, and it's also a great way to get active. As part of our #GoHealthy campaign, BCHN created walking paths for the Fordham area to inform local residents about readily available areas in local parks and open spaces. New Yorkers for Parks created guides to provide Bronxites with key information on the seven local parks and open spaces in the Bronx REACH CHAMPS initiative. The guides are now available in English and Spanish. BCHN is using bus shelter advertising to promote walking to local Fordham parks. The maps and park guides can be downloaded here. GroundTruth is a podcast about global reporting on the front lines of the planet’s most urgent issues — from terrorism to global warming to income inequality. An upcoming episode will cover the opioid epidemic in the Bronx. 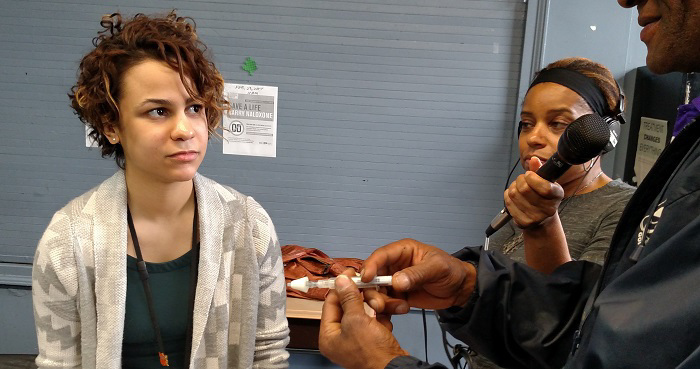 It includes audio from a Naloxone workshop conducted January 31st by BCHN community health worker, Yaritza Holguin, at Montefiore's Comprehensive Health Care Center (CHCC). 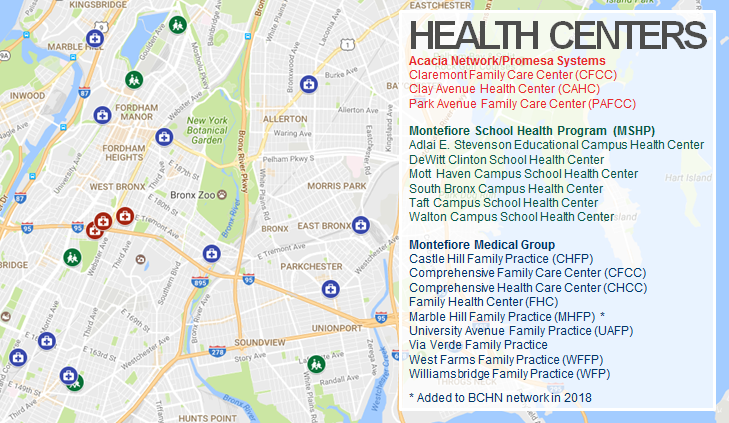 CHCC has been a member of the Bronx Community Heath Network since 1997. GroundTruth reporter Stephanie Daniel spoke with others at CHCC, including Dr. Chinazo Cunningham, about Naloxone, a prescription medicine used for the treatment of an opioid emergency such as an overdose or a possible overdose. Photographs were also taken at the workshop for inclusion in a report Mayor Bill de Blasio's office will be releasing soon on opioid treatment. On February 23, another Naloxone workshop was held at Argus Community for a packed room of ACCESS II Care Coordination Program members. "Having the training is very beneficial for the community to learn how to prevent overdose," said Maria A. Rodriguez, Vice President of Care Coordination Services. This workshop was covered by Voices of NY for inclusion in a forthcoming story. 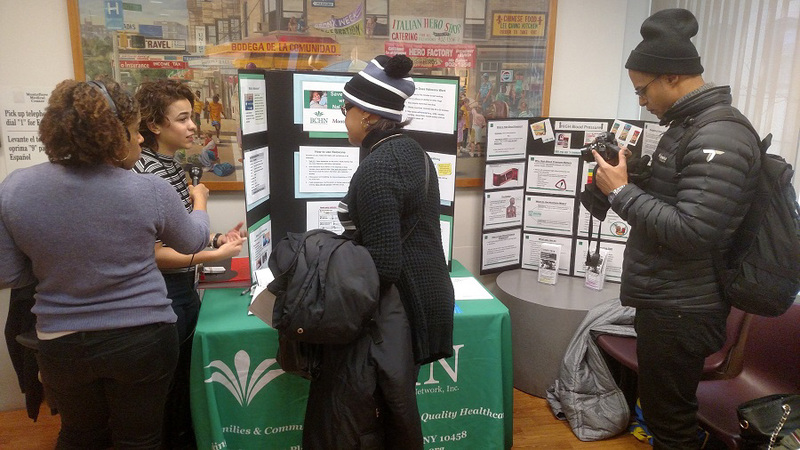 Over the past several weeks, BCHN community health worker Rhea Chandler and health educator Arousiag Markarian have been meeting community members in public libraries around the Bronx to inform them about health insurance and the importance of enrolling for health care. They also share information about the many direct and referral services BCHN has to offer. Participants are able to ask questions and express their concerns about navigating the health care system. 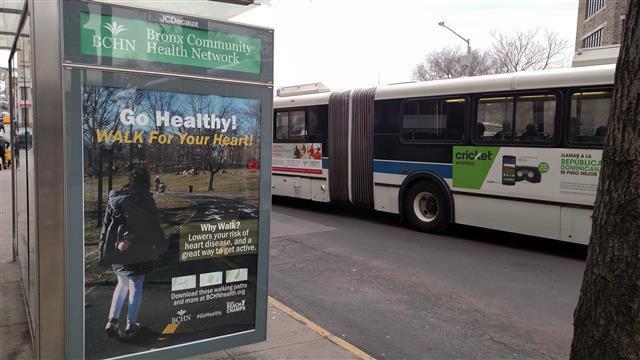 The Community Health Promotion and Education Program (CHPEP) team was featured in the February Bronx Partners for Healthy Communities newsletter. The recipe below has been recommended by the American Heart Association. 1. In a medium heavy-duty pot, add water, quinoa, and salt. Bring to a boil; cover and reduce heat to low. Cook until quinoa absorbs all the liquid, about 15 minutes. Remove from heat. 1. Into a large zip-top bag, add marinade ingredients: 2 tablespoons canola oil, minced chipotle pepper, adobe sauce, honey, salt, and pepper. Add chicken breasts into the bag, making sure the chicken is well-coated with marinade. Let sit for 10 minutes (make the quinoa as you wait) or place chicken in the refrigerator to marinate for up to 24 hours. 2. Into a large nonstick skillet over medium-high heat, warm remaining 1 tablespoon oil. Add chicken breasts and marinade liquid, using tongs to frequently turn the chicken breasts to be coated in marinade. Sauté until chicken is fully cooked, around 4 to 6 minutes depending on thickness. Remove from heat. When chicken has cooled slightly, transfer chicken to cutting board to chop into bite-size pieces. Then, transfer remaining liquid from pan into a small bowl; stir vinegar into the liquid to use as a dressing. 3. To assemble, add the greens into the bottom of each bowl. 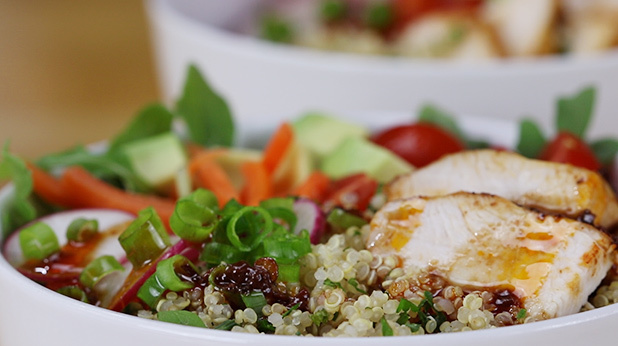 Divide quinoa and chicken among each bowl, along with tomatoes, avocado, carrots, radishes, and scallions. Drizzle with the dressing and serve. 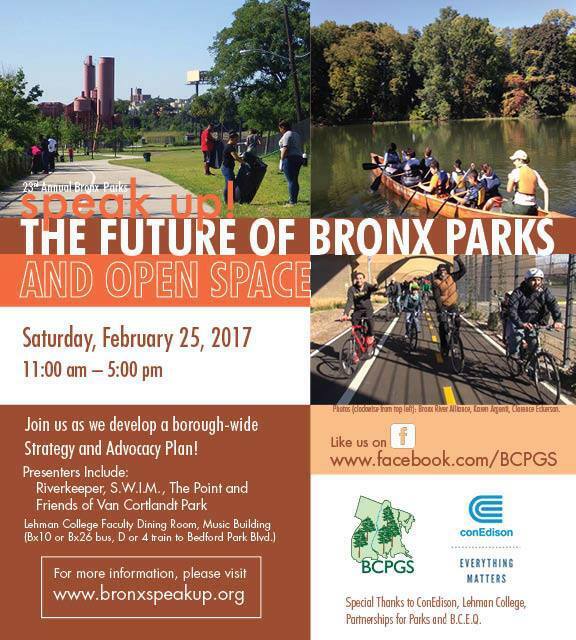 The 23rd Annual Bronx Parks Speak Up free event will be held on February 25th in the Music Building at Lehman College. This year's theme is "The Future of Bronx Parks and Open Space." Each year, this event draws 300 plus Bronxites who care about Bronx's Parks and Open Space come to network and attend presentations from community experts. 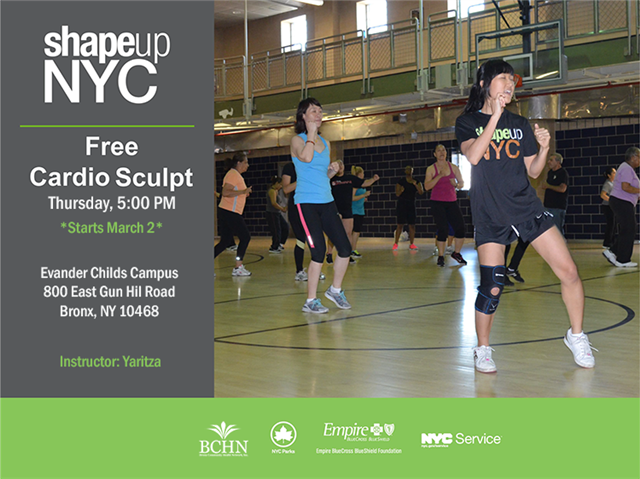 Free ShapeUp NYC "Cardio-Sculpt" classes will be taking place every Thursday at 5:00 PM, starting on March 2nd at the Evander Childs campus (800 E. Gun Hill Road). Kathryn Davis, a certified Qigong instructor, will be providing six free public Train-the-Trainer workshops in Qigong gentle relaxation techniques on six Mondays during March and April. The classes will take place at the Family Health Center, 1 Fordham Plaza, 5th Floor Meeting Space C, Bronx, NY, 10458, at 5:00 PM-7:00 PM. Classes will be held on March 13, March 20, March 27, April 3, April 10, and April 17. There will be a special introductory information session on Friday, March 10 at the Family Health Center (time to be determined). New Yorkers for Parks will be providing two free public workshops in March 2017 on How to Obtain a Park Permit. Dates and time will be announced soon. Train-the-Trainer classes on the measurement tool System to Observe Play and Recreation in Communities (SOPARC) will be taught by Beth Bingham. The training is being provided to staff of New York City Deptartment of Parks and Recreation; park friends organizations; Parks and Recreation committees from community boards 7, 9, and 12; and community residents interested in learning about gathering data to enhance current parks programs. It will also help strengthen advocacy efforts for additional support for parks.